much love, illy: celebrate good times, come on!! rainbows, capri suns, and sun-kissed faces. beards are not my thang. when i'm about to sneeze, grab your camera. Holla!!! June Sponsorship Spots Available NOW!! are you up for a little star-gazing? a letter to the best mom in the world. i heart you and you and you and you. can i scrunch my nose after surgery? and that, folks, is the sound of freedom. it's a brand new month. i just can't believe how fast the month of april came and went. and now we are staring at the month of may. but this month brings me butterflies. in a good way. it's brand new. so many exciting things are unfolding. wedding plans are happening. summer days are nearly here. the sun is warm and shining. the wildflowers are blooming. smoothie runs are now inevitable. and oh, did you check out the new sponsors? don't they all look so lovely over there. be sure to show them some lovin'! i'm so happy to have every single one of them! and with so many Americans last night, i celebrated the fact that justice was served. my heart and prayers go out to the military, their families, and everyone affected by 9/11. p.s. are you Katie (#40) of Beauty like a Kaleidoscope? 'cause you just won the After Nine to Five giveaway! shoot me an email at muchloveilly[at]gmail[dot]com to claim your prize. congrats to Katie - and thank you, Ashley for an awesome giveaway! and peeps, don't forget to enter the Sense and Sensibility giveaway posted today! 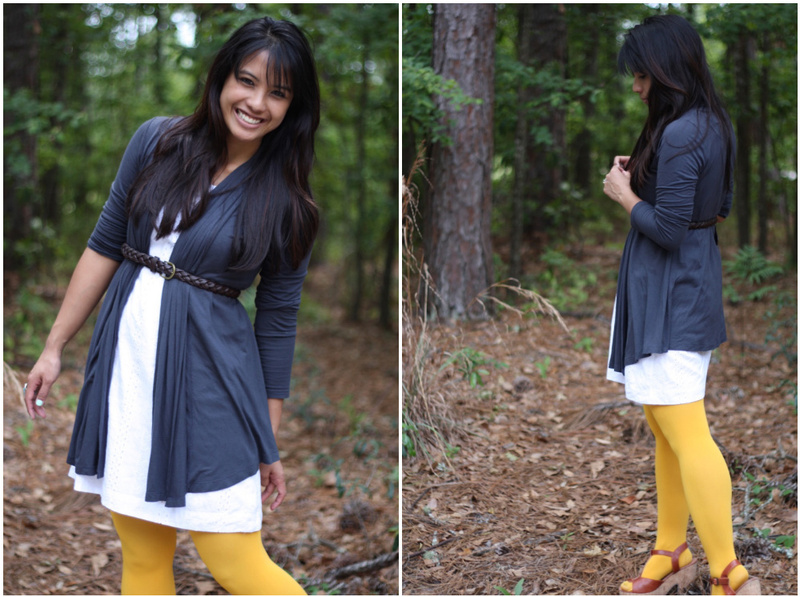 Loving the yellow tights with your white dress! You look adorable! LOVE those tights girl! so cute! Cute cute outfit! Happy Monday indeed! Loved your tweets this last weekend. This might be my favorite outfit post you've ever done. Those tights are AWESOME! Love you, friend! I like this outfit a lot. Its adorable! Love love love the yellow tights I have some too- they rock. Lady! This look is uber lovely! I esp love your tights! I'm with you, I'm glad that after nearly 10 years justice was served. It's how it should be. great outfit! I love that you wear your style SO well. More people should do that. I love the tights so much! And I was definitely up late watching the news (and reading twitter). I hope it brings a little peace to the families of those who died on 9/11. cute outfit pretty girl. and best of all it looks like it's comfortable too! I'm seeing a lot of Blowfish around the internet. I'm going to check out their shipping prices to Canada. ooh, such pretty yellow tights! Love the outfit and hair! I love the color combos, I'm soo plain. and trying to change that! You look darling pretty lady! I love your yellow we love colors tights, and cute Blowfish shoes! Those. yellow. tights. are. perfect!! !